Tonight I decided to not do a traditional blog post. I found this same format on another Slicer's post, and I love what she did with it. It's nice to get a bunch of thoughts on paper when I can't decide what to write. I am watching an episode of Giada at Home. They're making an awesome rice dish. I'd try and make it, but I'm pretty sure my waistline wouldn't like my afterward. I keep tons of things I should get rid of: clothes, purses, shoes that hurt my feet, statements or papers I get in the mail...I'd write more, but it's probably not a good idea. I wish I could find more time to stay neat and organized. As a mom, I have every intention of doing things after my daughter goes to sleep. When that happens, all I want to do is relax. I love my family and my closest friends. I don't know what I'd do without any of them. It feels wonderful to have such an amazing network of people to lean on. I dance to 80's music while cleaning my house. I did it the other day and it was so much fun! (The music channels on Verizon Fios are the BEST!) Tears For Fears, anyone?? I sing to my daughter any chance I get. I love seeing her start to dance or try and sing along with me. I think too much about things in the future. Things I can't even control. It gives me anxiety and nothing is even happening. I need to stop doing this. I really want to get my anxiety under control. I've been this way my whole life; I'm always nervous. I found working out a little bit each day has helped me. If nothing else, it tires me out enough to let me sleep deeply at night. I need to finish making my lunch for work tomorrow. I can't stand running around packing lunch when I should be getting out the door to go to work. I should go to bed at a reasonable time. I always wonder what it's like to get a full night's sleep. I'm talking 7-8 hours. I can name almost any song by hearing the first 1 to 2 notes. It's a gift. I can't explain it. I am so glad I visited your blog tonight! What a fun little group of thoughts-- random as promised, but so insightful. We have a lot in common! I love this format, too. I will probably use it soon, and pass it on to my students as well! Thank you! I'm so glad to hear! Thank you for reading. Great to know we have a lot in common, and it's great to know I connect with other people. Hope it turns out well with your students! I love this format and learned so much about you from reading it. I made so many connections with the topics that you included and hope that you use them as a springboard for future slices. I would love to hear more about all of these thoughts. Great idea! 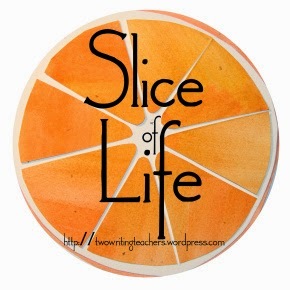 I was just writing and thinking, but it never dawned on me to use each one as a future slice. Thanks for the idea! I love your random post, putting it in my "try out someday' file. Keep singing to your daughter and dancing and cherishing these moments. They pass much too quickly. I too will keep this format in my "try it" bin. I can agree with most posts.....but ont he reality TV fighting? Seriously, I am with your hubby on that one! Love this. I think I will have to try before the month is over. This is such a good idea for a post. I feel as though I really know you after reading it-- it's such a simple format, but you took it and ran with it and were able to share really beautiful moments. I enjoyed this because I am going to have my students do bio poems next week, and this felt similar to a bio poem. Thanks for a glimpse into your life right now. I could make some connections as a mother. I am glad that you have found exercise to help you with your anxiety. I feel like I have been able to be more calm and not as apt to get too worried over time as well. Thanks, Amanda! It's nice to connect with other moms. I wrote tonight's post about my struggle with baby weight and doing my T25 routine. It has helped but I still struggle. Thanks for reading!